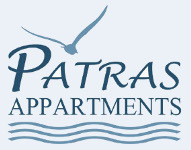 Patras' Apartments - 13 things to do before you leave from Fourni! 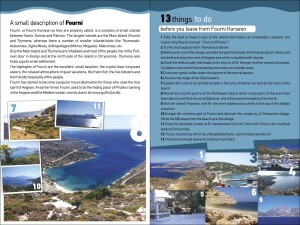 13 things to do before you leave from Fourni! Home 13 things to do before you leave from Fourni! Take the boat to make a tour of the island and realize its remarklable coastline, the reason why they are “Fourni of Pirates” ! Try the most popular dish of the island: The famous lobster-spaghetti. Walk south-out of town-and take the path that leads to the beach Kampi.Just below the old windmill. Climb the difficult path of the church St. George and let the sweeping views take your breath away. Drink your greek coffee under the big tree of the central square of the island. Discover the magic of the beach Vitsilia. Explore the ruins of an ancient temple in the area of Kamari as well as the ruins in the beach. Marvel the ancient quarry at the beach Petrokopio which many parts of the area have been taken to built the church of Ephesus, one of the ancient wonders of the world. Visit the island Thimena, and for the more adventurous climb to the top of the mountain Selada. Escape the northern part of the island and discover the simplicity of the village Chrisomilia. Climb the 600 steps from the beach up to the village. Enjoy the beautiful sunset of the island at St. Haralambos Church-11 km from Fourni. Try our local honey which its unforgettable flavor, cant be found anywhere! Try the homemade desserts made by miss Patra.